Now we're talking! This watch looks good. Attention! Gift idea for me to all relatives and friends that owe me a favor. Yeah, that's right. You know who you are. I saw you drop a ball on number 12 last week when you couldn't find yours. And you didn't count it! I can make things very uncomfortable for you next week at the men's club! 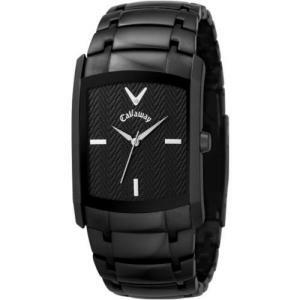 The Callaway Golf Men's Sport Watch. The same price as some of the other "sport watches" made by larger companies, but with quite a bit more class and style! This watch is fully stainless steel in the case and band, has a nice and comfortable folding clasp -- all in a very sharp black color. It is water resistant to 50 meters, and has a nice 3-hand quartz analog movement. Keep your sport watches; this is a watch that you can wear during the round, and then keep on your wrist for a nice steak dinner afterward. Dressy and casual, this watch would make a very nice gift.